The launch of 'Remnant', an exclusive new suite of prints by Toby Paterson published by Glasgow Print Studio. 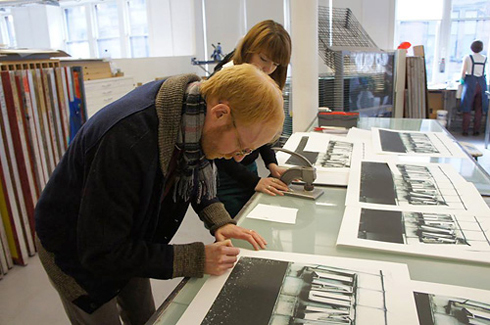 Above: Toby Paterson (with GPS Workshop Manager Claire Forsyth) signing prints from the Palimpsest edition. Image: Toby Paterson, Palimpsest, 51.5 x 70 cm, screenprint, 2012.